Please note that the objective questions will be in English and Hindi and also note that the Descriptive Papers of only those candidates who secure minimum qualifying marks in each of the objective tests will be evaluated. Negative Marking (Penalty for wrong answers) – The question paper will have negative marking. The negative marking will be 1/4th of the total marks assigned to a question. So for 1 mark question, it will be 0.25 and for 0.5 mark question, it will be 0.125. Plz send me IBPS syllabus or old sample paper , plz send me as soon as possible. sir, kindly send me the IBPS CWE sample papers for PO and Clerk on my mail ID as soon as possible. 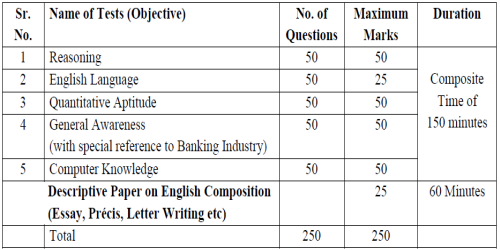 Smart work for banking aspirants. Can You please tell that can a final year graduation student can appear the IBPS common written exam ??? THIS IS AKASH SAO.I REQUIRE ALL THE DETAILS OF EXAM CONDUCTED BY IBPS,SBI,RBI AND FURTHER BANKING EXAMS. KINDLY GIVE ME ALL THE DETAILS IN MY EMAIL ID….akashsao123@gmail.com….I ALSO REQUIRE PREVIOUS YEARS SOLVE QUESTIONS AS WELL AS SOME MATERIALS FROM YOUR END SO THAT IT WOULD BE BENEFICIAL FOR ME TO CRACK THE EXAM. I HAVE BEEN FOLLOWING YOUR WEBSITE FROM THE PAST YEAR. ITS A VERY HELPFUL WEBSITE AS IT MAKES US EASY TO UNDERSTAND. THANKING YOU HOPING FOR THE QUICK REPLY….